We're aiming at releasing a client update tomorrow (Thursday). Maintenance should be under three hours and will start at 10 AM GMT. Based upon Community feedback we are extending the Halloween event until November 13th. Happy Pumpkin Hunting! Fixing an issue that could cause certain Purple Pumpkins to be invisible for some players. Fixed the locational information for a purple pumpkin that was on the roof of City Hall. Previously, players who had this pumpkin would have seen a blank system message, rather than this Pumpkins location information. Fixed a mission system issue that could cause a Fight Club district to crash. The Colby Commander can now be traded on the marketplace. Added an auto-pledge feature that means you'll automatically pledge to your factions Halloween contact when a mission starts for you in Asylum. Added new names to some of the areas in Financial, so that it is easier to distinguish where they are when looking for purple pumpkins. This affects: Border, Eastside, Gretsy, and North & South Havalnyd. Updated the description text on the Piercing modification to make its functionality clearer. Adding descriptions for community created vehicles for the 'noob-mobile' contest. We're aiming at releasing a client update tomorrow (Tuesday). Maintenance should be under three hours and will start at 10 AM GMT. Fixed a mission related issue that could cause an Asylum district to crash. Joker Mystery Box 7 Now Available! Created to celebrate the 125th Anniversary of the last War of San Paro, the Colby Commander combines the modern design and performance of the Colby RSA with the iconic aesthetics of the Wild West. This limited edition version has a uniquely embossed receiver that comes with a mod to allow bullets fired to penetrate targets. Adjustments to the firing mechanism of the weapon allow the bullets to pierce most objects they hit (not including vehicles and walls). The act of piercing an object however heavily reduces the hard damage, as well as reducing the damage done to subsequent objects hit. Damage reduced 30% per pierce. Ladies and gentleman, boys and girls, it’s that time of year! Starting today and lasting until November 6th at Midnight PDT, ALL players are invited to participate in the 2013 Halloween Costume Contest. This year we want you to make a reference to something in pop culture; we want to get you. Who do you idolize? Who’s your favorite noteworthy person or character from something? Or who do you think is just plain ridiculous, insane, hilarious, or noteworthy? We want you to show us. Special Linus rule: No Miley Cyrus. I know you were thinking it and…no. Just no. Each winner gets 4,000 G1C (in duo and group situations, each participant gets the 4k). Winners will be chosen from amongst all servers, and we will be verifying that you’re using your own customizations. We're aiming to release a client update today (Friday). Maintenance should be no more than three hours (we'll try to be as quick as we can) and will start at 4:30 PM BST. The Asylum missions will now give out more standing than before - they were not giving out as much as we had intended in the last patch. They will also give out slightly more cash too. Fixed a vehicle exploit with the Purple Pumpkins. Fixed a rare mission issue that could cause an Asylum server to crash. We believe some people are having problems pledging to Trick or Treat. This is because you can only pledge to contacts while off a mission - and Asylum starts a new mission pretty quickly. If a mission is running, please wait until the mission has ended and pledge before the next one starts. Their Daily activities are only available once you max (level 6) Trick or Treat, and you can only take one between missions. As an aside, Trick is the Criminal Contact and Treat is the Enforcer contact (I know this confused some people). The dev team is looking to see if they can increase the delay between missions in Asylum. We're aiming at releasing a client update tomorrow (Thursday). Maintenance should be under three hours and will start at 10 AM BST. Halloween is back for a special spooky two week event! This year we've brought back a mission based version of Asylum with Trick and Treat and added Daily Challenges, Fright Club rewards and a special, character unique, Evil Pumpkin hunting activity to Financial and Waterfront! There are all sorts of treats to unlock during the Halloween event; including the new clothing assets: Devil Wings and the Witch/Wizard Hat! Standard Activities : Halloween themed activities for Joker Tickets. Rare Activities : A rare activity that awards Joker Tickets and a special weapon skin: Purple glow in the dark with a bat motif. Gold - A 10 day lease of the STAC 10 "Tactical". Bronze - 200 Joker Tickets. This is a special Pumpkin smashing activity that will be unique to every character on every account! When you log into an action district you'll be given a selection of Evil Purple Pumpkins to hunt down and destroy. When you get close to a Purple Pumpkin you'll hear it laughing, after it has been destroyed you'll receive a message saying how many you have left in the district and in what area the next one can be found. You can use your in-game map to find the location of the area name you've been given. Level 1 (50% of assigned Pumpkins over both districts) : A special Orange glow-in-the-dark weapon skin with a pumpkin motif. Level 2 (100% of assigned Pumpkins over both districts) : A set of Devil wings for your character. Functionally identical to the Joker SR15, the Somatic Tactical Assault Carbine was produced by Somatic to offer a military grade alternative to the civilian Joker carbine. The STAC provided military groups with the power of the Joker carbine with none of the ‘difficult’ associations of civilian weaponry. NOTE : You can earn a free 10 day trial of the STAC 10 "Tactical" by earning gold in the Fright Club Challenges! Fright Club Challenges will rotate on the 24th, 28th and the 4th of October. Added skin support for the Dartgun. VIPs now appear on the Elective Spawn map. Falling off a ledge while you are moving faster than the sprint speed limit will no longer suddenly make you stop firing / throwing grenades. Deleting a prop in Financial that was intersecting a bin behind Gaijin. Fixed the Joker weapon skin for the Agrotech DMR. Fixing Joker Distribution skin on the Flare Gun. We're going to be releasing a small client update tomorrow (Tuesday). Maintenance should be under three hours and will start at 10 AM BST. Fixed an issue that could cause APB to crash when running other software in the background. Yep, it's time for the annual scare-fest that is Fright Club in APB Reloaded. We've gone all out this year to make sure that this is the biggest and best Halloween event we've put on yet! We'll be starting the event on Thursday 24th October and running right through to Wednesday 6th November, that's almost two weeks of frightening fun and petrifying prizes to be had! Now on to what's new this year. Daily Activities will be available for Trick and Treat in the Asylum District. If you can max them out you'll get access to these special Halloween-themed activities that reward your hard work with Joker Tickets. Be on the lookout though! There is a super-special rare activity that each player will only get one shot at - make it count to get your hands on a unique purple glow-in-the-dark weapon skin with bat motif! Level 1 - A unique pumpkin-themed, orange glow in the dark weapon skin! Level 2 - A set of brand new (and only available here) customisable Devil Wings! To top it all off, we also have special Fright Club Challenges for the duration of the event. Complete enough in-mission activities in the Asylum District to claim your prize! Bronze Challenge Complete - Joker Tickets for use in the in-game Joker Distribution store! Silver Challenge Complete - Scary Clown Mask (available week 1 of event) and a brand-new Witch/Wizard's Hat (available week 2 of the event)! Gold Challenge Complete - A whole stack of Joker Tickets and a 10 day lease of a brand new weapon you can't get anywhere else! Lots to get your hands on, so make sure you get into APB Reloaded during the event! Now, if ghouls and ghosts aren't your thing, we've also got a sneak peak at some upcoming content for you. We're tentatively calling this the 'Punk Pack', and it contains a couple of long-requested items including new backpacks as well as the goggles that made Javez famous. The pack also introduces a new weapon from Somatic Advanced Tactical Systems, who seem like they're trying to match a Joker Gunworks favourite. Get your hands on a unique variant of this new weapon by completing the Gold Fright Club Challenge in Asylum! 1.13.1 sees the introduction of medal tracking to APB. It you open your character info screen ([J1) and select the Achievements tab. you'll see that we've added a medal section that shows you all the medals you've earned. We started tracking these in 1.13.0, so anything you've eamed since then will be displayed already and anything you have yet to earn will be greyed out. We've added Pan 2 oi the Artist Programme as well as Music by Certain Death and a remix of a track by "A Space Love Adventure' by Farfletched. We've implemented a new chat command that allows players to take a snap shot of their network performance to assist us with evaluating and improving the game. and server's. network performance. Players simply need to enter /latencytest into the chat bar and the game will start taking a snapshot of relevant data (traceroute, ping time etc). This process takes 10 minutes and the player can stop it at any time by re-entenng the same command again. The information will be output to the log folder. in APBGame/Logs/, as "Latency - (Date).csv". Adding the winning vehicles from the "Noob Mobile" forum contest to Joker Distribution in Breakwater (Social district). Added weapon skin support for the ACT~44 magnum and updated the Golden Marksmen skin to use the latest gold shador. Adding Weapon Skin support for the Stabba PIG and Stabba NL-9. ACES Rifles and SMGs leased through Joker Distnbution are now skinnable. Players can now use team chat while dead. Players can no longer place personal waypoints on the elective spawning map. Fixed an issue that could occur if you attempted to close the game in windowed mode using the cross button on the top right. Fixed an issue were your client would crash on deleting the last character on your account. Fixed a data issue that could cause a server to crash. More fixes for issues related to data clean up, that could previously have led to client crashes when the user switched districts or closes the game. Further fixes for issues related to streaming and garbage collection that could previously have led to client crashes. Criminal kill streak activities now correctly reset on arrest. Role and achievement data will now be correct for the player you are inspecting - previously it would show your data as theirs. N-HVR 243»SDs now use the correct weapon inventory icon. Fixed an issue where if you cancelled the rename dialog. it would do the same as pressing OK.
Nano's without a silencer no longer say that they have one in the description text. Fixing the HUD text of the Daily Activity 'Like a Gelding Knife'. to correctly tell players to kill a heat 5 Enforcer. Fixing the HUD text of the Daily Activity 'Shock and Awe'. so that it is now correctly using 'Notoriety rather than 'Prestige". Fixed a visual corruption issue with the tires of the dump trucks and cement mixers. Details of APB's upcoming massive engine upgrade. First let me get this out of the way; we think GTA V is a very good game. We always look for great competing products when we figure out what we should be working on next, and clearly GTA sets the bar very high. The September 17 release of Grand Theft Auto V, and the follow on October 1 release of GTA Online had a massive impact on the whole game industry. 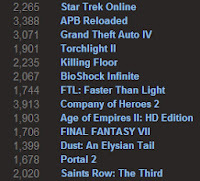 Using Steam Data as a general PC-activity level sampling tool (keeping in mind Steam only tracks activity for those game installs that originated from Steam itself and not from publishers' websites, which means it only shows a small portion of gamers in non-Valve games, but shows 100% of gamers in Valve created games) it appears Online-PC games in Steam's "western-market areas" took an average 30% percent hit in normal average peak CCU levels when players jumped onto the GTA V bonanza. Given GTA V broke the record for top grossing 24 hour sales in the history of ALL entertainment, one would expect the wind to get knocked out of the rest of the game industry for some period of time, especially for action-oriented games like Saints Row, All Points Bulletin and Planetside. More specifically, because APB Reloaded is also very similarly themed to GTA V with the same player demographic (even though APB is far more skill and map knowledge based, and far less 'arcad-y' and 'aim-assist-y' than GTA), we were pretty much standing on the GTA train-tracks waiting for a possible collision (and GTA of course having a much 'shinier' and newer engine, much larger development resources, deeper content and years of iterative development under its belt made it a hard challenge to face). When the dust finally settled last week, it actually turned out that APB Reloaded was not hit any harder than the average Online PC game (again based on before-and-after comparisons of average PC game Steam numbers for the top-100 PC Steam games). Not to say we didn't take a dent. But we are still here. Still plugging away. And still working on our ambitious long term plans. Steam Peak CCU for players accessing PC Online games through Steam as a before-and-after comparison of GTA V's impact on the overall online game market. Slowly but surely, starting last week, we also started seeing players returning to APB, which has helped us breathe a little bit easier this week. Our giant super-secret engine update that we have been working on since July depends on players continuing to support our game, so we are incredibly thankful that players are returning to APB once they have gotten their GTA fix. For those who have followed APB Reloaded closely over the last several months, we recently made some significant team changes. In September we introduced the APB community to a person we think is the best community manager on the planet (Tiggs, with 20+ years of online community management experience dating all the way back to Ultima Online and Star Wars Galaxies) and we also appointed Joe "Linus" Willmon to be the the new head of APB's production team. We also concentrated our internal efforts on the newly begun stealth engine upgrade mission, and numerous improvement and performance items. Tiggs and her new team has also done an AMAZING job of keeping the community up to date, and leading the efforts around tracking down performance issues and continually updating the players of ongoing bug fixes and updates. Our massive "Secret Engine Upgrade Mission"
APB clearly was born with tech in an era that pre-dates GTA V by one full ‘game and engine generation.’ As those who have followed us for the last few years know, APB Reloaded uses Unreal 3 version 2007 and 2008 as its primary game engine (basically the version of the engine used by the original Unreal Tournament 3 that came out in 2008). Therefore the upgrades mentioned on the Unreal 3 Wikipedia Page do not apply to APB's original engine. Due to the vintage of the engine, we keep bumping up against performance limitations, and also severe limitations in our product development speed. Because we use many custom systems in the game, it takes a very long time for our team to make material changes to the game, resulting in a lot of features being shelved or delayed. An upgraded engine would let us tackle important things like min-spec system performance, lighting system improvements, net code improvements and new graphic card optimizations and it would likely lead to a faster content creation pipeline by taking advantage of new systems available in the updated engine. The team performed small upgrade tests throughout 2012 and then Johann "Aphadon" took a serious stab at the task in April 2013 to test if we may be able to fix just 'some' of the older rendering code that causes some of the frame stutter (for example with some particle effects that have been shown to have some serious performance problems). But taking that approach turned out to cause other big follow-on problems when fixed in isolation. So to combat the overall problem, the drastic decision was then made to let a part of the team go off and map out what it would take to upgrade "everything." And with that, we really do mean "everything"
The 2013 version of the 'vanilla' Unreal engine contains about 25,000 source code files of various types. The original APB game and custom engine contains 61,609 files in total, out of which nearly 35,000 were source code files (the other tens of thousands of files are content and config files). The mission; merge these terrifyingly massive projects. To complete the merge it turns out that our team has to merge roughly 10,000 source files, representing well over 1,000,000 lines of code. And then get them to compile. And then fix all the dependencies between these files, and fix features and functions that end up breaking as a result of the merge. By end of last week (October 11, 2013) the team had finished the basic merge pass of 9,393 files, which leaves them only a couple of hundred files to go. Once the team gets everything to compile, then the long and painstaking effort of solving for issues and dependencies get underway (not to mention the massive QA and testing effort). An upgrade of such a customized game as APB presents some particular issues. The first one is that RTW originally created a ton of code that added custom versions of features that were not natively supported by the engine. Many of those features (day-night cycles, building systems etc.) were later independently created (and optimized) as engine features by Epic, but by then the RTW code path had already diverged from the original engine code. In 2007-2008 adding these items (like day-night cycle to textures, and city building tools) were huge engineering feats. Some of the custom code lead to the development of some really amazing functions that remain top of the line, like the character and vehicle customization systems. Of course it also lead to being dependent on certain ‘dead-end’ custom features, that are hard to break the dependencies for after the fact. The other big issue is that Epic traditionally performs a massive amount of optimization and performance work around each of their own releases for their own games. Most notable Gears of War 3 that came out in 2011, several years after the APB engine version we use today. The GOW-3-optimized engine is also sometimes referred to as "Unreal 3.5" given the very large amounts of code (network code, light systems) optimized in preparation for Epic's Gears release. Of course the APB code base (to date) contains none of those upgrades (bar a few items we added such as some net code from a later engine and of course the singular integration with Scaleform). And in the last few years as Epic began to start supporting mobile and tablet devices (as evidenced by Infinity Blade) the engine started supporting incredibly optimized and compact build targets, something that was not really a focus in the original engine. Aphadon (our lead developer on this task) will pen a more detailed technical post about the upgrade in the next month or so when we are getting closer to something that's actually testable. Also, as we get closer to launch we should be able to predict the performance (and optimization) characteristics of the upgraded engine. The current roadmap puts a full 'upgraded APB engine' sometime at the end of Q1, 2014, but as with all roadmaps, that could potentially change. The team is clearly working insanely hard on this particular task, and we think it will finally allow us to also unleash a lot of potential that has remained locked away in the custom code the game has been saddled with. As an added bonus, by upgrading the engine, we also open some interesting possibilities, including a path to launch on other platforms in the future. Linus will be penning a separate post about the ongoing server-performance testing that's led by Tiggs and her team, as well as the Halloween stuff coming very soon. Also, I am personally very curious about Rockstar's decision to sell in-game currency directly in GTA Online, especially given the many reported GTA Online glitches that basically could make the whole currency purchase process moot. It's a very interesting idea, so I may pen a whole post just about their add-on transaction system. It's something we are looking at very closely. And as always, thanks for continuing to support APB for the past several years, and with these massive coming changes, we hope to continue keeping APB strong for years to come. Fixed an issue that could cause the Daily Activity timer to display an incorrect value for the remaining time, in certain regions of the world. Fixed an issue where the RFP-9 "Comanche" had the wrong mod in it (it had "Magazine Pull III" rather than "Extended Magazine III"). We're going to be releasing a small client update tomorrow (Thursday). Maintenance should be under three hours and will start at 10 AM BST. Adding weapon skin support for the DMR-AV. Fixed an issue with the Snub nose kill activities that was previously preventing the user from being able to progress the activity. Contagion ACES Event is no longer triggered by snubnose kills. Fixed an issue with Chrome Skin on the DMR. Please Note : We are aware of an issue where some countries will see the daily activity cycle timer as an incorrect value. This is because they are not in the same time zone as our servers, which use UTC. This is a purely visual issue – the cycle time will currently always be at midnight UTC, for Daily Activities. We are currently working on a fix for this issue and hope to have one in place as part of next week’s patch. Thank you for your patience in this matter.